What does it mean to be “conservative” and teach in a modern public school? One of the central tenants of conservatism is prudence; thus it would be wise to begin this exercise with an honest but playful explanation of what it does not mean. It does not mean cascading posters of Ronald Reagan on the four walls of my classroom. It does not entail watching old YouTube clips of William F. Buckley’s television show Firing Line. It certainly does not require me to assign Ayn Rand novels as required summertime reading. And it most certainly does not nurture any real hope of high school students grasping the towering genius of the prodigious mind of Edmund Burke. Being conservative in the classroom has no functional consequence, no clandestine modus operandi cloaked in the subliminal channeling of a Thomas Sowell, Milton Friedman, or F.A. Hayek into my lessons on layer-cake federalism, the due process clause, or the differences between a PAC and a Super PAC. My job is to teach American civics to high school students and whether or not I experience a flicker of delight when reading David Brooks in the New York Times (I do) or a reactive annoyance with some regularity when mentally digesting the columns of Paul Krugman in the same newspaper (again, I do), has no bearing on the pedagogic task before me. As my friend and colleague at The Educator’s Room, Jake Miller, eloquently writes in the accompanying piece to this essay, explaining why a teacher might sympathize with one political party or philosophy does not qualify as “a bash on nor an exclusion of” the opposite side. But this doesn’t mean my political sympathies don’t mentally and emotionally play a role in framing my understanding of the role of education in a modern democratic society. In this sense, it most certainly does. Well, I unapologetically believe in the universality of Jeffersonian (or Newtonian or Lockean) natural law and the justness of American constitutionalism. On balance, I believe in the power of free markets to liberate human beings from the soul-crushing vice of generational poverty as long as there is a backdrop for those who are disadvantaged. Most of all, I believe in the primacy of culture over politics in the titanic civic struggle to set the tone (and decide the relative successes and failures) of any civilization. I believe that a successful life requires a robust, Earth-shattering, ineffably extraordinary education so as to confront the endless maelstrom of life’s balancing acts: how can my students exercise liberty without becoming licentious? How can they work for equality without silencing their adoration of human excellence? How can they simultaneously be critical of their nation without sacrificing a deep appreciation of all that is right and laudatory about it? The ultimate question for any teacher of any subject at any grade level is this: how do we imbue our students with the requisite knowledge, virtues, and behaviors that are necessary if the project of American self-government is to be renewed (dare I say “conserved”) for another generation? The Janus-like answer requires that education confront both the public and private selves. First the public: the constitutional architecture of America’s civic life demands a specific form of politics and thus a specific type of participation from America’s citizenry. The central feature of America’s governing machinery is the reality that social progress is never the consequence of a single presidential executive order, an isolated writ of the court, or ad hoc directives from a military general. A system of robust institutional competition among the three branches, shared powers between the state and federal governments, and a bifurcated national legislature all ensure that incrementalism is the dominant narrative of American politics. In such a system, citizenship demands citizens who can be principled but also open-minded, highly eager to find common ground amongst the pluralistic tapestry of the electorate. While broad and disruptive change is sometimes necessary—national responses to Depressions or World Wars, reversing deep and systemic discrimination that runs counter to the spirit of our highest ideals and principles–even in these circumstances small, craquelured divisions must be countered with a spirit of consensus and compromise. The New Deal was the consequence of the Senate finally deciding that, once and for all, something had to be done to counter proliferating poverty, even if it contradicted conservative dogma at the time. The ultimate victory of the Civil Rights Era was greater than the individual pieces of legislation it spurred—the Civil Rights Act, the Voting Rights Act, the ratification of the 24th Amendment. As Martin Luther King so eloquently explained, the struggle for civil rights wasn’t about white America versus black America, it was “the fight between light and darkness…We must oppose all exploitation…We want no classes and castes…We want to see everybody free.” The Civil Rights movement was nothing less than a transformation of the national consciousness, a transformation at the most urgent and penetrating levels, convincing a large segment of America to finally live up to the Declaration of Independence, the Gettysburg Address, and the 14th Amendment. Thus, progress in our constitutional system is the consequence of citizens knowing how to converse with one another—listening and considering arguments that might run counter to our preferred preferences, allowing ourselves to be convinced or do the convincing, acknowledging that every difference of opinion is “not a difference of principle,” building coalitions by celebrating consensus instead of repeating the same etiolated clichés that act as barriers of division. Unfortunately, turn on cable news or span the editorial pages of American newspapers and there appears to be little effort to create these meaningful accords of consensus. Teachers who believe in conserving the values of the constitution should be concerned with fostering the types of civic behaviors that allow this constitutional system to flourish. Teaching students to balance tolerance with conviction and empowering them to see the value in small victories is a Madisonian task. This behavior can and should be modeled in the education students receive. If students can embody these traits in a classroom then they can also do it in voting booths or the halls of congress. Anybody interested in “conserving” constitutional self-government would likely agree. But what about the private sphere? To believe in conservatism is to ultimately believe that certain knowledge and virtues are timeless in their value—that human fulfillment on an individual level and the flourishing of a civilization on a collective level requires that a citizenry value certain behaviors and beliefs. And when these ubiquitous qualities are abandoned, social decay will certainly follow. Conservatism is inherently suspicious of strong centralized authority because the things that make human life worth living—the formation and pursuit of one’s dreams, learning how to love others and to be loved, confronting the endless cycle of life’s disappointment with neither a nihilistic shrug nor a despairing smirk, learning how to stand tall even when others doubt or denigrate you – have very little to do with government and everything to do with character. The success of institutions that socialize, cultivate and perpetuate this character in individuals is paramount if a good life is to be lived. Good Americans of all persuasions can disagree about health care policy or how to confront ISIS, yet the proliferating vulgarity within the public square, the violence we consume and celebrate in our entertainment and on our street corners, not to mention the brazen libertinism that only becomes more omnipresent and unapologetic, are droppings of a culture that does not seem to inculcate a value system that will yield a generation of young people ready to succeed. Ask any high school teacher if they are alarmed by the cult of celebrity; the endless parade of lush materialism; the drugs that are endlessly available; the shallow eroticism on display at school dances; the foul language that is rarely censured even if a teacher is present; the notion propagated that good teachers are the easy teachers. Don’t stop on a high school campus. Look on college campuses. Look in urban areas. Look in poor rural communities. The value system of a culture is always revealed in the behaviors it chooses to celebrate and promote. 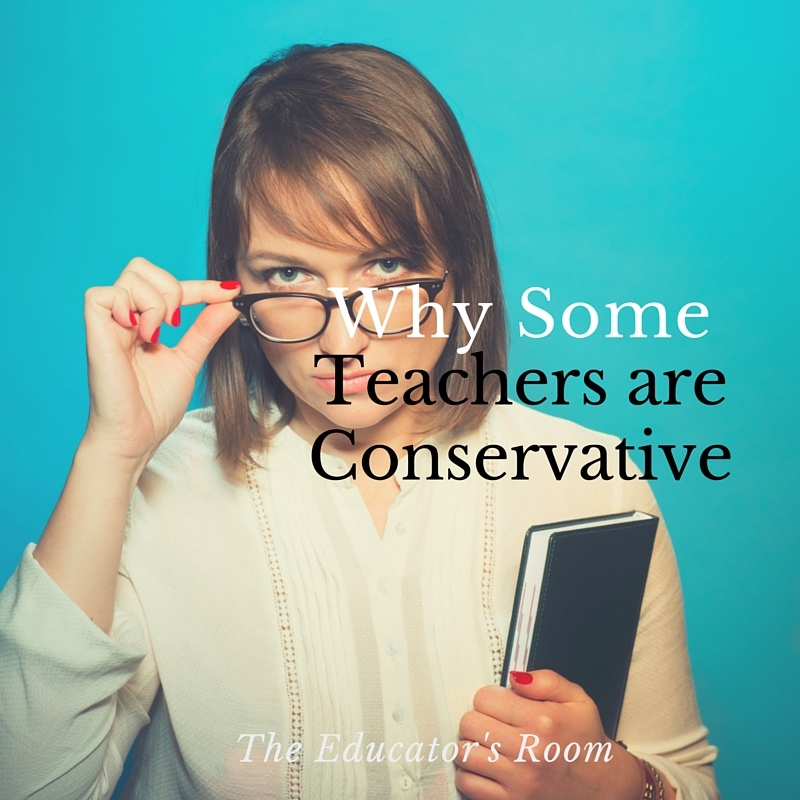 Being a teacher who is conservative informs my conviction that, yes, America needs both resources for the truly disadvantaged but also a place where character can be formed and passionately practiced. No amount of government largesse, no amount of redistribution, no technocrat , can instill the inner-drive and character that is necessary for success in this life. Sociability will take place in the course of a child’s life. Denying the role, or promise, of education in this process is both dangerous and naïve if for no other reason that it misses the opportunity to encourage behaviors that are associated with a rich and vibrant life. Truth be told, oftentimes teachers cannot overcome the destructive influences in the lives of our students. America is for everybody. But sometimes not all Americans can take advantage of what it has to offer. This is a tragedy and should not be tolerated. Conserving what works and what has always worked is essential if the promise of America is to be realized by everyone, regardless of where they are born. As Americans, we should always be open to the liberal principles of progress, reform, and choice but also mindful and appreciative of conservatism’s high regard for continuity, duty, and timeless truths. Love this. Reassured me that I may truly be “conservative”, despite my displeasure with the “side of the aisle” that identifies as such (while they fail to acknowledge some of the truths and principles I hold dear).